Tag Archive | "Cochu’s Blue Tetra (Boehlkea fredcochui) aka Blue King Tetra"
Cochu’s Blue Tetra (Boehlkea fredcochui) is also known to tropical fish keeping enthusiasts as the Blue King Tetra, and erroneously as the Blue Tetra. This species, Boehlkea fredcochuik, has been absent from the aquarium trade for many years, with most tropical fish keeping shops mistakenly selling the Blue Tetra (Knodus borki), as Cochu’s Blue Tetra (Boehlkea fredcochui). Cochu’s Blue Tetra is an extremely active shoaling fish that is found in the Amazon river basin; specifically the Rio Maranon in Peru, South America. Cochu’s Blue Tetra has a silver and blue body with a blueish horizontal stripe at the lateral line and a dark splotch at the caudal fin. They have a concave tail and transparent fins. Females are are generally less colorful and plumper than males. Cochu’s Blue Tetras are extremely active by nature and in order to minimize aggression, need a more spacious tank than most other tetras of the same size. Although aggression is generally limited to conspecifics, when confined in smaller tanks, they tend to harass smaller fish regardless of species. A densely planted 30 gallon or larger tank with a sandy or fine gravel substrate, some driftwood or bogwood and a few rocks, some floating plants to diffuse light, and plenty of swimming space will keep these fish happy. They require good water quality that is highly oxygenated with a moderate amount of current in their tank, and because they are a schooling species, they should be housed in groups of at least 6 to 12 of their own kind. Boehlkea fredcochui are relatively easy to breed and they are currently being bred in Florida for the aquarium trade. They are egg scatterers and require soft, acidic water for the eggs to hatch. Conditioned females will deposit their eggs on the undersides of broad leaf plants and because the parents will eat the eggs, successful breeders remove the eggs to a brooding tank immediately after spawning is completed. The fry can be fed infusoria, newly hatched brine shrimp or finely crushed flake food. Cochu’s Blue Tetras should be fed a mixture of high quality flake food or micro pellets. Their diet should be augmented with fresh, frozen or freeze dried brine shrimp, Daphnia , bloodworms and tubifex to maintain optimal health and color. 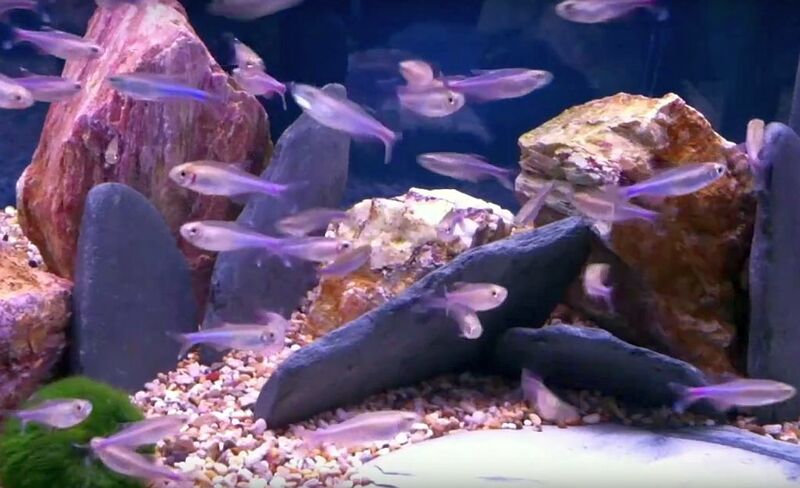 Cochu’s Blue Tetra is rarely available to tropical fish keeping enthusiasts, but farm raised specimens are occasionally sold when they are 1″ to 1 1/2″ in size. This species is not ever common in the aquarium trade.